It takes Overwatch fans mere minutes to churn out fanart for each newly-released character, but a few long weeks or months to welcome them into their competitive mode teams. But for maybe the first time ever, Overwatch’s newest hero, the mad scientist Moira, has been immediately accepted into the game’s competitive community with wide open arms. Overwatch has seen five new heroes since its release in May, 2016. After each release, the heroes suffer through varying levels of Overwatch meta purgatory. Players took about a month to stop condemning teammates who chose Orisa and Ana in competitive matches. Doomfist and Sombra have been less lucky and, in most levels of play, are considered risky picks. Crows of “change plz” and “nooooooooo” greet players who choose heroes looked on as iffy. Why the hesitation? Like suspicious cats eyeing a visitor from a dark corner, competitive Overwatch players don’t easily take to new things, and especially when those things can compromise their competitive ranking. So shaming teammates who make rogue hero picks into submission is just a part of the culture. That didn’t happen with Moira, a support hero who equally heals teammates and drains the life out of enemies with a beam and an orb. A week after Moira became available in Overwatch’s competitive mode, her pick rate on PC was an inspired 7%—many, many times more than Doomfist (.6%), Orisa (2%) and other newer heroes in the same time period. It also helps that she wins slightly over half the games she’s played in. Overwatch’s community has loved Moira since the day she was born. Why? Moira is intuitive to play. She feels like the evil brainchild of Zenyatta, who both heals allies and damages enemies with his orbs, and Symmetra, whose high-damage laser locks onto enemies. Her teleporting move—which, by the way, gives her great mobility—looks like others we’ve seen in the game, too. Picking her up, I had reference points for how evasive I should be, how far behind tanks I should stand while I healed and what risks to take when killing enemies with my beam. Moira immediately feels like she’s meant to be in Overwatch, something other new heroes’ designs didn’t quite manage: Sombra’s hacking and sneaking techniques at face proved difficult for kills-focused DPS players to grok and Doomfist essentially plays like a fighting game character (in part, that’s why he has one of the lowest pick rates in Overwatch’s competitive mode). Moira is a very, very safe bet when skill rating is on the line. Moira also added something Overwatch desperately needed: another very competent healer who doesn’t depend on aiming. After the game’s main healer Mercy received a very righteous buff, games without her were rare, in my experience. Other healers averaged about half of what Mercy does on average—until Moira came along. Moira now the second most powerful healer, an attractive alternative that energized the competitive’s support class meta. Also, since her attacking and healing rays lock onto targets, and her orb literally bounces all over the place, nobody has to stress about not clearing some invisible skill barrier when it comes to aiming (And, so far, I haven’t heard of too many players condemning Moira for being low-skill). When I’m queueing up for an Overwatch match, I often suffer low-level anxiety about which heroes teammates will pick. It’s nothing a doctor would prescribe something for, but it’s there. That’s because some picks can compromise my ability to perform well—for example, if we don’t have a tank to absorb damage, it’s harder for squishy DPS heroes to get kills without dying. Moira hits that perfect, gratifying balance between helping me mow down enemies and healing me along the way. A few times, I’ve been standing out in the open, steamrolling two or three opponents with with lighter attacks before realizing that, actually, a Moira was standing behind me dealing half that damage. That’s the ultimate support. Designing with an eye for how a hero can echo well-loved designs and fit into lots of common situations may seem less exciting than putting out another Doomfist or Sombra every few months. Designing with an eye for competitive play in general could be stifling to players who just want to have fun and chill. It’s good that Blizzard takes risks with new Overwatch heroes. Sometimes, it’s the community’s reticence to risk-take that’s the most damning for them. 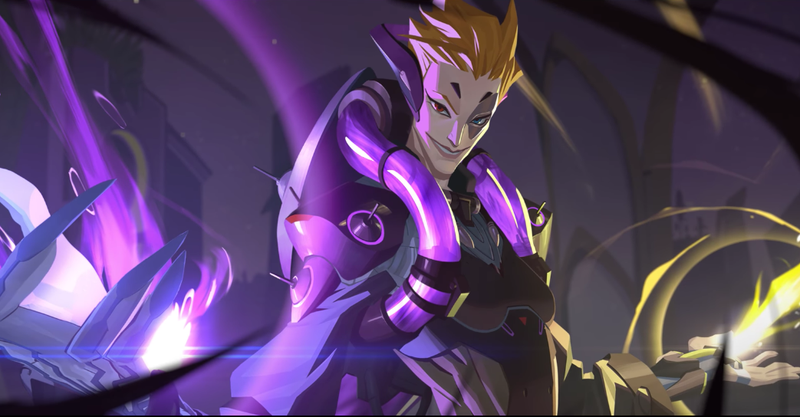 With Moira, perhaps her relatively safe design will whet players’ palates for some more left-field ones.